I have reached week 37 which means that I am full term. 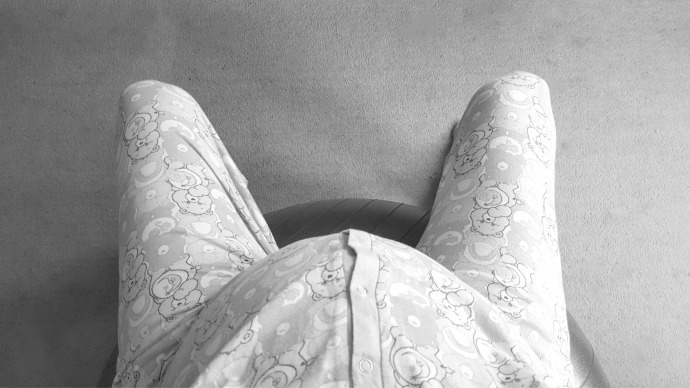 It feels like a period of limbo, this five weeks that are considered the 'right' time to have a baby - knowing that very soon everything will change, but for now we are just waiting. Nobody knows when this little girl is going to arrive, it could be tomorrow, it could be that I have another month of carrying her safely inside, but she is coming. I feel completely torn, physically I don't feel ready for another baby but emotionally this pregnancy is taking its toll. We don't have everything ready for her yet and whilst this pregnancy has been tougher than the others, I don't feel ready to give up my bump, to share my baby with the world and to never be pregnant again. I know that even when I am struggling physically I have it easier than most women, at 37 weeks I can still scramble around soft play, still power walk a double school run when I leave it too late to do comfortably (again) and still care easily for three young boys. I have plenty of aches though, I was told with fourth babies they can engage and pop out several times a day and I am pretty sure that Britney bump is playing that game. Sometimes I waddle, sometimes I am taken aback by the power of her kicks and sometimes I just really want to find a comfortable position to sleep in. Emotionally however, I am finding this time a lot more difficult. I seem to go from full of energy, ready to run a marathon to needing to sleep for a week and barely able to get off the sofa - and I do this about 5 times a day. I can be incredibly excited and happy one minute and really grumpy the next without any real cause and I get periods of feeling really anxious too. My biggest craving right now is space, which of course isn't something I get a lot of with three young boys. I can't go to the toilet without an audience and I think knowing how attached I will be to this baby once she arrives, how impossible it will be to leave her, makes me crave a bit of 'me time' now whilst I still can (in principal). I can often tell what will help bring me out of a grumpy mood, but unfortunately the timing is always terrible. I fancy a long walk just as dinner needs to be cooked, or I am desperate for a hot shower just as I have to go on the school run. The bloke has understood that it is best to always have chocolate buttons in the house for these moments - if in doubt, sugar always helps. I am not doing anything to try and bring on labour, I really believe that babies come when they are ready and I am feeling so torn between wanting her here so that I feel a little more hormonally balanced (well as much as you do with a newborn of course) and wanting her to stay put until I feel a bit more ready. Having such a small age gap this time and the fact Finn is still just a baby, not yet walking, means that I probably won't ever feel really ready for her arrival and I know that whenever she comes we will be fine. These final weeks are such a strange time, I feel unsure making too many plans, but I know the best thing is to stay busy. I want to treasure every moment as we are but I can't wait to meet this baby I have been growing for so long. I am looking forward to the birth but wondering how I will cope with four under fives. I want to enjoy my bump a little longer but I want to meet the final member of our family. It really feels like we are in limbo now and I have a feeling there are a few more weeks to go. Loads of luck for the coming weeks and wishing all well.